Redacted screen shot of "regional representatives" claim today on the website of JSS Tripler/JustBeenPaid. BULLETIN: The PP Blog has learned that JSS Tripler/JustBeenPaid is publishing a page in which it advertises the availability of “regional representatives” in various parts of the world, including Italy. The page also touts the native-language talents of JSS Tripler/JustBeenPaid affiliates to assist members in Hong Hong, Taiwan, Belgium, Canada, Ireland, the United Kingdom, the United States (to assist people who speak English or Japanese), Germany, Lithuania, Indonesia, Malaysia, Mongolia, Poland, Portugal, Latvia, France, Chile, the Dominican Republic, Ecuador and Spain. “The people on this page have been thoroughly trained in all the workings of JustBeenPaid’s programs, and are happy to assist you TODAY!” the murky entity crowed. In a Feb. 23 conference call, Frederick Mann, the purported operator of JSS Tripler/JustBeenPaid, declined to say precisely where the “opportunity” itself was located. JSS Tripler/JustBeenPaid, Mann asserted to an audience of Americans and at least one person who claimed to be a resident of Canada, was “not located in any specific part of the world. “We’re all over the planet,” he said, speaking with an English accent that appeared to be native to South Africa. BCCI’s collapse also triggered Congressional probes in the United States, along with both civil and criminal prosecutions. 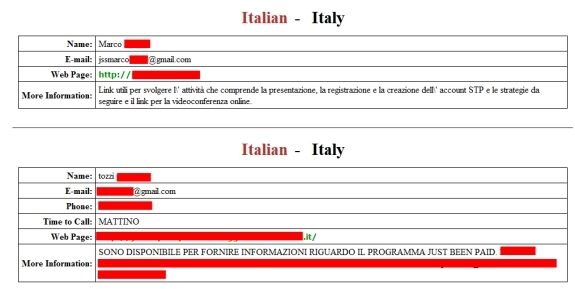 The CONSOB probe in Italy, which the agency announced nearly six weeks ago, was not referenced on the “representatives” page on the JSS Tripler/JustBeenPaid website. How long the JSS Tripler/JustBeenPaid regional reps have been in place was not immediately clear. Also unclear was whether each of the reps had a physical presence in the respective countries or were using the Internet to reach over borders and perform customer service and recruit downlines in the respective nations. The U.S. government and other governments of the world have become increasingly concerned about cross-border fraud. Yesterday, U.S. Attorney General Eric Holder and Janet Napolitano, the secretary of the U.S. Department of Homeland Security, met with top officials in Canada to discuss the problem. HYIPs have been the subject of both civil and criminal litigation in various jurisdictions. It is common for HYIP purveyors to tout purported “offshore” operating venues and to claim such venues insulate an “opportunity” from prosecution. It also is common for HYIPs to announce they are “private” programs and therefore not subject to government oversight. At the same time, it is common for HYIPs to try to structure a Terms of Service or Member Agreement that purports either that the “opportunity” is not selling securities or is not subject to regulatory oversight. 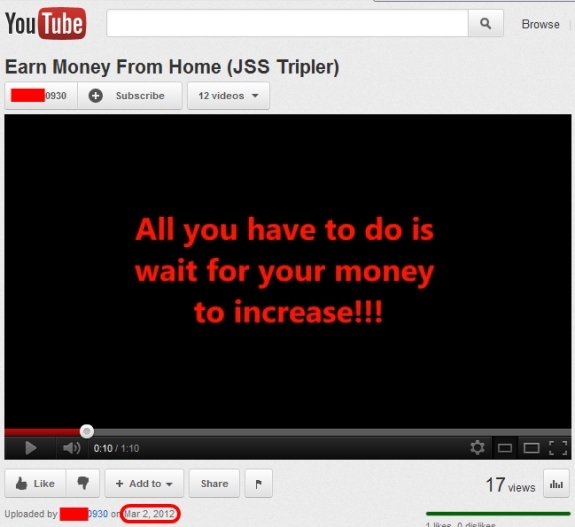 Some HYIPs, including JSS Tripler/JustBeenPaid, have preemptively denied they are Ponzi schemes. JSS Tripler/JustBeenPaid purports to pay a daily return of 2 percent. On an annualized basis, the sum is between 48 and 73 times the purported returns of imprisoned Ponzi schemer Bernard Madoff. It is EIGHT times the daily return touted by Gregory McKnight, who pleaded guilty last month in federal court in the Eastern District of Michigan for his operation of the Legisi HYIP scheme. The purported returns of JSS Tripler/JustBeenPaid are somewhat on par with the returns of Nicholas Smirnow of the alleged Pathway To Prosperity HYIP Ponzi scheme. Smirnow is listed as “Wanted” by INTERPOL. On Feb. 27, the PP Blog reported that a website linked to Mann displayed videos of Francis Schaeffer Cox, an American and purported “sovereign citizen” under indictment in Alaska in an alleged murder plot against public officials. Neither the March 3 Blog post nor the March 2 YouTube video referenced the CONSOB probe. In 2008, AdSurfDaily President Andy Bowdoin asserted that ASD had a plan to create 100,000 millionaires in three years. On Dec. 1, 2010, the U.S. government announced that Bowdoin had been indicted on Ponzi-related charges of wire fraud, securities fraud and selling unregistered securities. About 16 days later — on Dec. 17, 2010 — U.S. federal prosecutors announced they had filed forfeiture litigation against at least two ASD affiliates. One of the alleged affiliates was purported ASD “trainer” Erma Seabaugh. Seabaugh also was an affiliate of an enterprise known as Ad-Ventures4U (ADV4u), which crashed in 2009 amid allegations that its operator had been threatened by members. In web promos, Mann has described himself as a promoter for both ASD and ADV4U. Some affiliates have described him as a “genius,” the same description accorded Bowdoin before the August 2008 raid on ASD headquarters by the U.S. Secret Service. It is a descriptor completely contrary to the typical view Americans have of the Secret Service, which has the twin duties of protecting the nation’s financial infrastructure and the life of the President of the United States. Most Americans believe the Secret Service consists of heroes who place themselves in harm’s way every day to keep the United States safe, doing everything from making sure U.S. grandparents have safe places to deposit their Social Security checks to making sure that the President is well-protected and accessible to the American people. Kenneth Wayne Leaming, an ASD member and purported “sovereign citizen,” allegedly filed a bogus lien against the Secret Service agent who led the ASD investigation in 2008, the FBI said in November 2011 court filings. Leaming also allegedly filed bogus liens against a federal judge and three federal prosecutors involved in the ASD case, according to court filings by the FBI. He is jailed near Seattle awaiting trial on those charges, along with charges of filing false liens against other public officials, concealing two federal fugitives wanted in a home-business caper in Arkansas, being a felon in possession of firearms and uttering a bogus “Bonded Primissory Note” for $1 million. Court filings suggest Leaming was conducting financial research on John Roberts, the chief justice of the United States and the head judge of the U.S. Supreme Court, while hatching a scheme to serve papers on Roberts through a school attended by the distinguished jurist’s children. Looks like there is a bit of unrest occurring on the JSS MMG Boards. Nothing like out and out anarchy (that will come eventually) but those that have at least 5th grade math skills are beginning to “Do the Math”. The issue seems to be those that buy big positions immediately prior to the ‘restarts’, they seem to be disproportionately disadvantaged. Seems like some of the big early leaders (Serial ponzi players) have already bailed and taken their efforts elsewhere. Could this finally be the beginning of the end? Maybe….. But, Frederick and his cohort, Carl Pearson, are sneaky, persistent, and, unfortunately, intelligent. So, I’m sure they’ll get at least 2 or 3 more “restarts” out of the suckers before they realize it’s all about the math and the blackbox. Stay tuned, film at 11.